/ Suunto Zoop Novo – Still the Best Entry Level Dive Computer in 2019? In this review we compare the Suunto Zoop Novo's features and capabilities against other entry-level dive computers in this price bracket. It’s hard to go past the Suunto Zoop Novo for entry level and recreational divers. This dive computer is designed to be strong and long lasting. It's an excellent start up dive computer for both features and price. 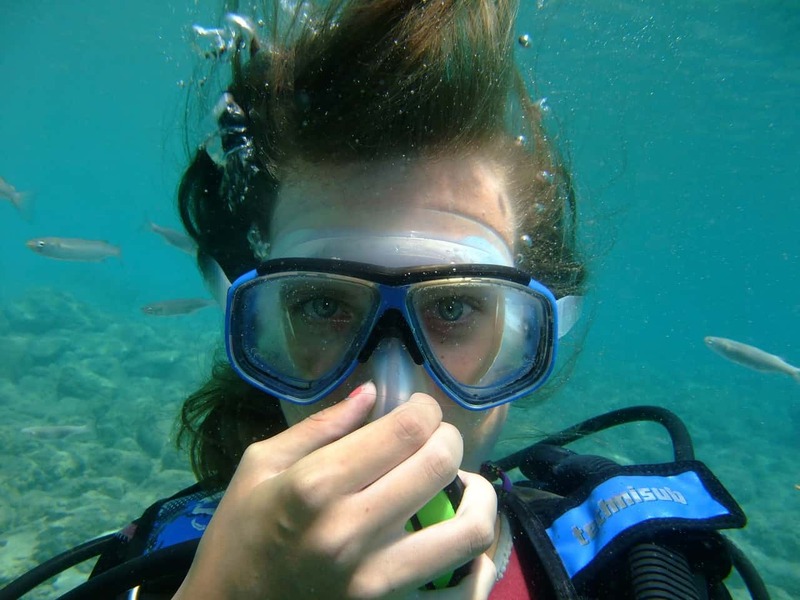 It has all the basic functions to keep you safe when diving. 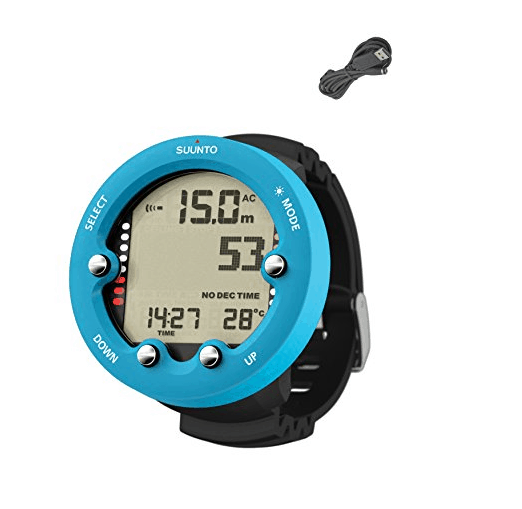 Click the button to see the latest price and any discounts that may apply on the Suunto Zoop Novo at Amazon. Click the item in the table below to skip to your most pressing question, or continue to read the whole Suunto Zoop Novo review. Which is the best Dive Computer for Beginners? Wrist Mounted or Console Based Dive Computer? How big is the Zoop Novo? What Functions and Features does the Zoop Novo have? How long does the Zoop Novo battery last? Can I change the Zoop Novo battery myself? Which Algorithm does Suunto use? What about the Dive Planner and Logbook, Bookmarks and Memory? Do I need to buy the USB Cable to download my Dive Log? What dive information is downloaded? What functions is the Zoop Novo missing? What about price and Warranty? What about Servicing, general maintenance and things to avoid? With its full decompression capability and nitrox capability, you won’t be growing out of the Zoop Novo anytime soon. If you extend on your training or decide to buy a more advanced computer later on, the Zoop Novo makes a great backup dive computer. The Zoop Novo weighs 4.23 oz / 120 grams. Diving modes include Air, Nitrox, Free and Gauge. There's a Deep Stop alarm on the Zoop Novo, a stop watch timer, and it’s able to run dual time zones. This dive computer has 4 buttons making the menu easy to navigate. The Zoop Novo has a backlight which can be adjusted or turned OFF completely. The backlight function makes it suitable for the occasional night dive. Log book memory hours - Based on a 20s sampling rate, the Zoop Novo has 140 hours. Sampling rates are adjustable and the Logbook also allows for bookmarks. Suunto Zoop Novo has a temperature range of -20C to +50C / -9F to 122F. The USB download cable is not included with the Zoop Novo. This is an optional extra at an additional charge. There are 4 entry-level recreational dive computers that are very popular and very similar in features and price. These are the Suunto Zoop Novo, Mares Puck Pro Plus, the Cressi Leonardo and Deepblu Cosmiq+. These are all high-quality diving computers with slight differences between them. The Zoop Novo and the Deepblu Cosmiq+ are slightly more expensive but both have additional features as well. Below is a comparison of the features and differences between these dive computers. The Comparison Table below also shows the differences between the most popular Recreational dive computers. Work out what features you really want from your dive computer, then just go for it! The Zoop Novo comes as either wrist mounted or console based. Most new divers are heading down the path of wrist mounted dive computers. The great advantage of wrist mounted is having the vital information on your arm where it’s easy to read, rather than tucked away on a console. 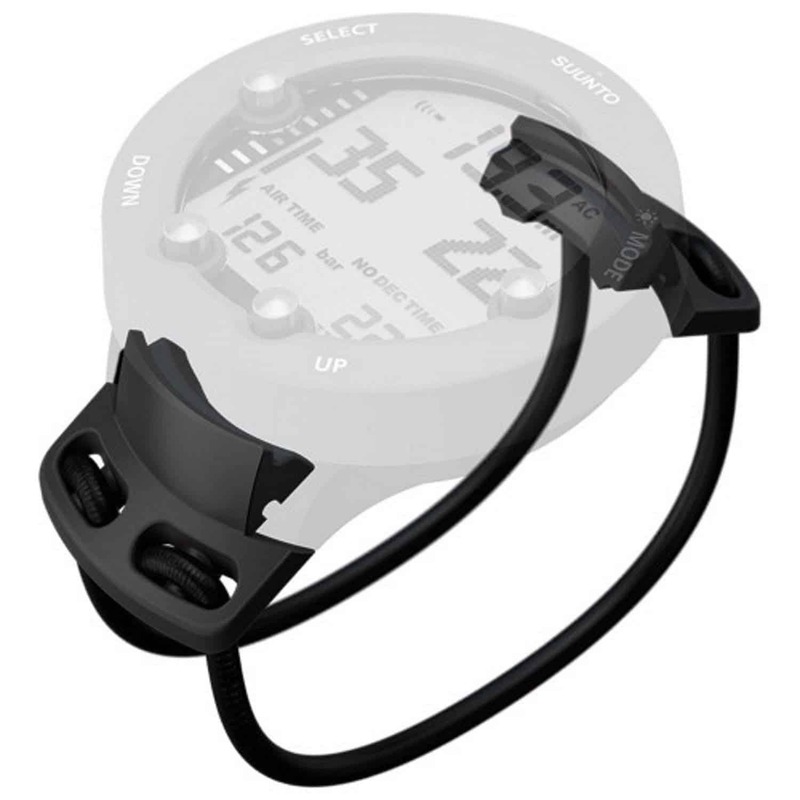 If you’re going for wrist mounted, then the black rubber strap that comes with the Zoop Novo is long enough to go over your wet suit or dry suit. As an alternative to the rubber strap that comes with the Zoop Novo, Bungee Adapter Kits are available as an accessory. This come as either a basic bungee adapter, or with a mount boot. The 4 menu buttons make navigating and setting up the Zoop Novo very easy. The video below shows how how easy it is to set up for Nitrox diving. There’s nothing small about the Zoop Novo. It's been designed with both functionality and durability in mind. The screen is hard-wearing acrylic which will take the odd knock. Its display size is a good 1 ⅓ inches across (or 40 mm) making it easy to read at a glance, even for 'older eyes'. The bezel diameter is 2.4 inches (61 mm) with a thickness of just over an inch, (28 mm). It weighs 4.23 oz (120 grams). Although the Suunto Zoop Novo is wrist mounted, it is not a regular watch-sized dive computer. It's far too big to be worn as an everyday watch. You can’t overstate the peace of mind that comes with having an interface that’s easy to operate. The Zoop Novo has some well thought out functionality. The Zoop Novo has a 4-button menu which are nice and big, making them easy to press. Menus are easy to navigate and the display is clear to read. The ZOOP Novo is water-activated. You should to turn it on to Dive Mode before diving to do your pre-dive checks but if you forget, it automatically activates as soon as it goes deeper than 1½ feet (0.5 meters). The Zoop remains in Surface Mode at depths less than 4 feet (1.2 meters) and switches into Diving Mode at depths greater than this. The standard dive alarms are all adjustable. A default setting will remind you to make a safety stop. Alarms can be set for maximum depth and dive time. If you exceed the no-decompression limit on a dive, the Zoop Novo will provide the decompression information you need to make a safe ascent. After this, surface interval and repetition dive information will be displayed. When switched on to dive mode, the battery indicator will show the current battery level. To conserve battery, the Zoop switches into its idle mode after about 3 minutes. During the idle mode it displays the current time, the day of the week, and the date. It’s easy to set to either imperial or metric units (feet or meters, ºF or ºC) depending on your personal preference. Traveling to a higher elevation will temporarily change the equilibrium of dissolved nitrogen in your body. It's generally recommended that you wait at least 3 hours before making a dive at a new altitude. As with most dive computers, the Zoop Novo comes with an Altitude setting. This is not automatic, you need to adjust it yourself. When you adjust the Altitude, the Zoop Novo adjusts its mathematical model according to which altitude mode is selected. The Zoop Novo calculates shorter no-decompression times at higher altitudes. The no-fly time is shown in the center of the display next to an airplane icon. Flying or traveling to a higher altitude should be avoided at any time the Zoop Novo displays the no-flying time. Life expectancy for the battery depends on the number of dives you have per year. As a general rule, if you’re diving around 300 times a year, the battery will last between 8-12 months. If you dive around 100 dives per year, you can expect to get about 12-18 months of battery life. Less than 100 dives per year, you should expect 18-24 months of life from the battery. The Zoop’s battery is a standard 3 volt CR2450. There is the option to change this without having to send it away to an authorized dealer or take it to a dive shop. If you decide to change the battery yourself, the Battery Replacement Kit can be purchased online. As well as a battery, the kit includes an O-ring and costs under $20. 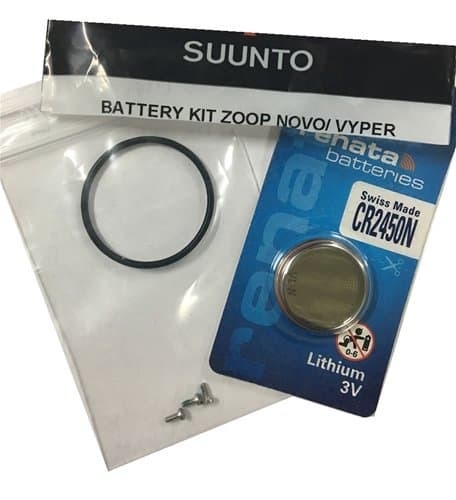 The video below shows how to change the battery on the Suunto Zoop Novo and the Vyper Novo. It starts with a warning that changing the battery yourself or using an unauthorized dealer may void the warranty. If you can get past this, it then demonstrates how EASY it is to change the battery. The screwdriver size used is a T-6 torx. If you don’t feel confident enough to change the battery yourself, then a new battery replacement can be included as part of the regular 2 yearly service by an authorized dealer. The Suunto RGBM (Reduced Gradient Bubble Model) is a modern algorithm. The algorithm model monitors continuous multi-day diving and closely spaced repetitive diving. It also takes into account dives that are deeper than your previous dive. 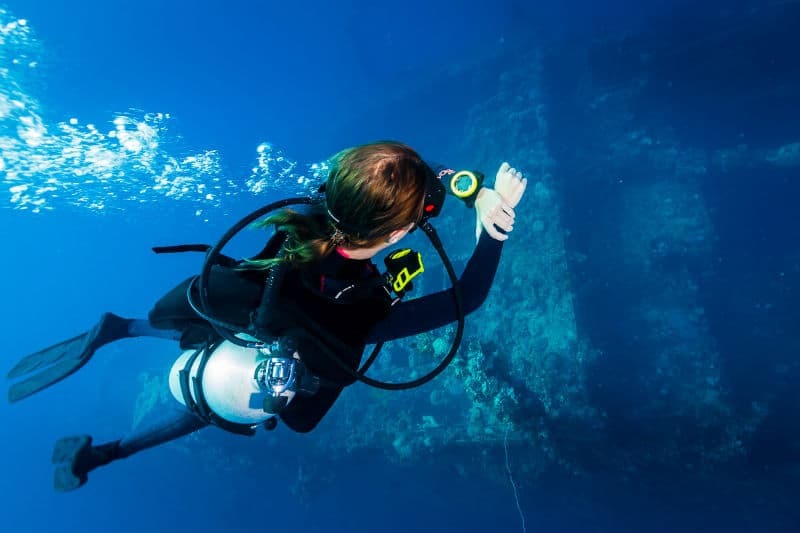 Some diving practices increase the risk of decompression sickness/illness. 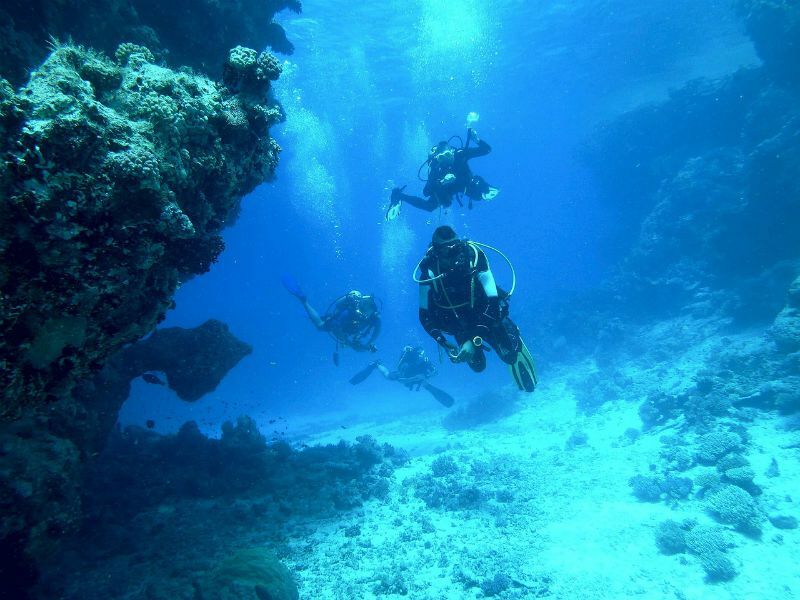 These include dives with short surface intervals, repetitive dives that are deeper than previous ones, multiple ascents, or substantial multi-day diving. The Zoop Novo will adapt the decompression algorithm when any of these practices are detected, and in some circumstances will advise that your Surface Interval time needs to be extended. The ability to adapt to different situations and dive profiles provides added safety. It also changes these calculations according to any personal adjustment you select. The Zoop Novo has a Dive Planner which is accessible by pressing the PLAN button on the front face of the computer anytime during Surface mode. Here’s where you’ll find the calculator for a no-decompression stop. Using the two buttons on the bottom of the face, you can increase or decrease your Maximum Depth. Once you’ve made the adjustment, the Zoop will calculate your no-decompression time. The no-decompression times given for different depths will then be shorter than before your first ‘fresh’ dive. Bookmarks can be made in the dive profile memory during a dive. These are shown as a blinking dive log symbol when scrolling the profile memory on the display. It’s easy to insert a Bookmark into a dive profile by pressing the PLAN button during a dive. The Log Book setting stores around 140 hours worth of dive time. The History setting stores the data from your last dive. You’ll need to transfer this to a logbook if you want to keep the information. The USB cable is an optional accessory and is not included in the price of the Zoop Novo. Buying the USB cable allows you to download your dive profile information to either a PC or MAC. The Suunto DM5 software is free to download from Suunto’s website. Once downloaded, reviewing the data is great for planning future dives, keeping records of your dive history, and for demonstration or educational purposes. additional dive information including personal information, and any SLOW and mandatory Safety Stop violations, Dive Attention Marks, Bookmarks, Surfaced Marks, Decompression Marks, and Ceiling Error Marks). An alternative to this is Diveboard: Your Online Scuba Logbook. The crew at Diveboard have created a free program called Diveboard Agent. After downloading, this connects with many dive computers including the Suunto Zoop. Sunnto and Diveboard have worked together to provide integration between Movescount to Diveboard. Another open-source option that’s worth looking at is Subsurface. There's no doubt that Suunto’s Zoop Novo is an entry level dive computer that has all the functions beginner divers need. Below is a list of the features that the Zoop doesn't have that I'm sure you want to be aware of. I've also listed alternative dive computers to look into if one of these features is particularly important to you. Surface Interval - In comparison to other dive computers, the Zoop Novo has a longer Surface Interval time. A minimum of 5 minutes is needed between each dive. If the Surface Interval is shorter than 5 minutes, the Zoop Novo treats the next dive as a continuation of the previous dive. No-Fly Icon not displayed when not turned on - The Zoop Novo does not display the no-fly icon when on standby. You need to activate it to check the airplane icon is not displayed before jumping on a plane. No Digital Compass, Tri-mix or Air Integration - The Zoop Novo doesn’t have a digital compass, tri-mix capability or air-integration. Compasses are cheap and widely available, but if you’re after a built in compass and air integration, then have a look at the Suunto Vyper Novo. No Bluetooth Connectivity - Unlike the Cosmiq+ which has Bluetooth connectivity, you need to buy the USB cable to download your dive logs and update your firmware. Click here to read a review of the Deepblu Cosmiq+ Dive Computer and see the comparison tables against its rivals. 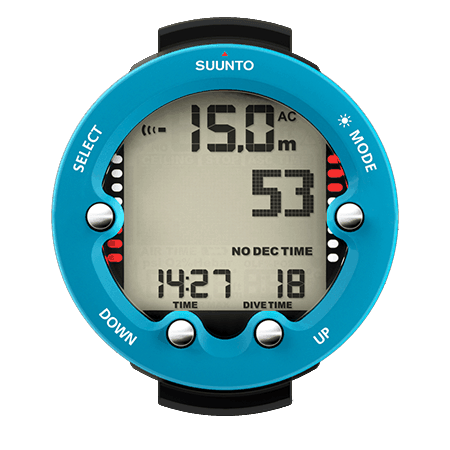 Large Dive Computer - If you’re after a watch-sized dive computer, look into the Suunto D4i Novo, and Suunto D6i Novo. 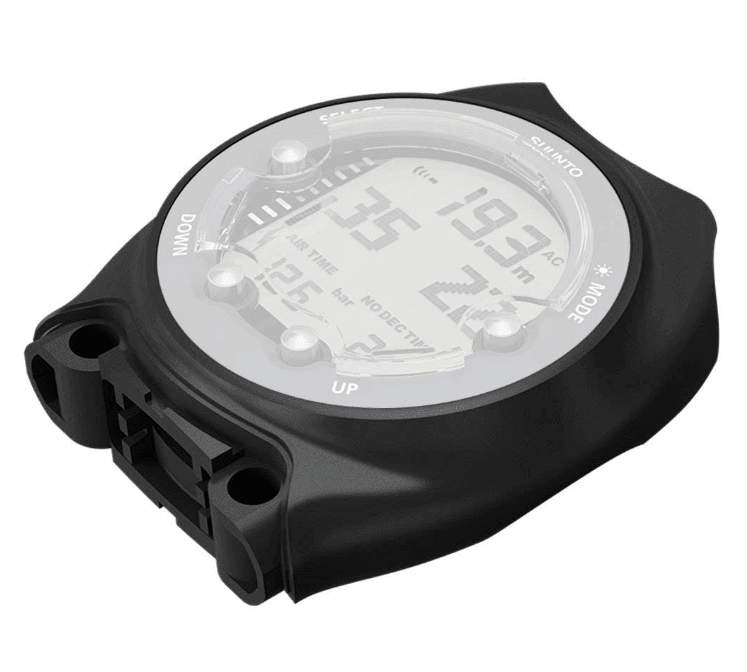 If you think you’ll expand on your training later on or are definitely headed towards more advanced recreational or technical diving, then take a look at the Shearwater Perdix or the Shearwater Teric. What about the Price and Manufacturer's Warranty? The Suunto Zoop Novo Dive Computer is well priced. You should be able to find it for between $280-$350 online. The USB cable needed to download the dive data to your laptop is around $70. The software is free to download. When the time comes to change the battery, the Battery Kit costs less than $20. These come with a 2 year Manufacturer’s Warranty. As it’s always better to be safe and avoid problems before a dive trip, plan to have the computer serviced every couple of years, or after 200 dives. Its calibration will need to be checked, as well as a test of the functions and the waterproof seal. To keep your Zoop Novo working well for years, always thoroughly rinse in fresh water after each dive. Make sure all salt crystals and sand grit are removed. It’s important that the water contacts/connector are kept clean. Clean with fresh water and a soft brush. Dry off and store in a cool, dry, well-ventilated place away from the damp. Regularly check the condition of the band, clasp and metal components. Over time these can become affected by a build up of sunscreen, perspiration and sea-salt. Protect the Zoop Novo from extreme heat, direct sunlight, and chemicals. Although well built, it won’t withstand the impact of heavy objects falling on it, such as Scuba tank cylinders. The Suunto Zoop Novo has the functionality entry level divers need. It’s easy to use and an excellent entry point computer for recreational divers. It has good features at an excellent price. The Suunto Zoop Novo is a great choice for your first dive computer. 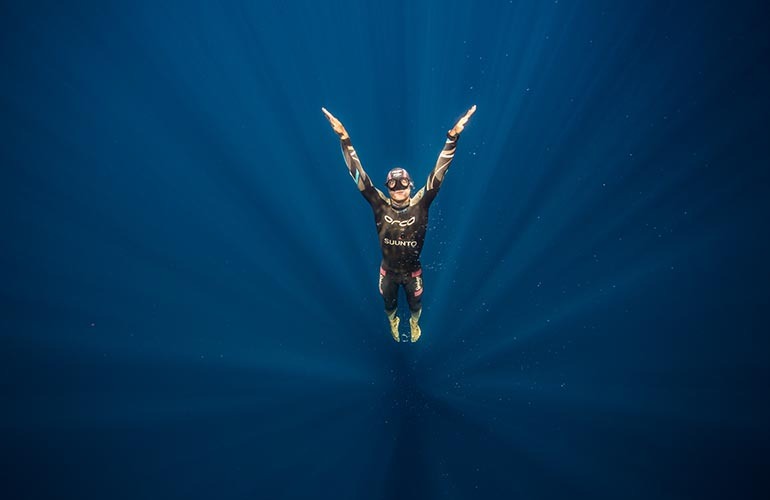 It’s even made our Best Dive Computers for 2019 list. Thanks for the in-depth review and pointing out the USB cable deal. I’m just beginning and the Suunto Zoop Novo seems to be perfect. I’ve hired the Zoop but as they’re not making these anymore, I like the look of the Novo. It’s above my originally planned budget but seems the added functionality makes it worthwhile. Definitely loving the water activated feature! That’s a way to save energy and not having to worry about turning the watch off/on. Also, the fact that you can hear it underwater is sweet! It sounds like divers will really benefit from the features. I love my Suunto watches. They’re a great brand for sure. The zoop is now on my want list. Do you know if there’s a video on how to change the battery myself? It’s probably worth the extra $20 if there’s a good tutorial on how to change it. Thanks! Hi Lauren, I’ve edited the post to include a video showing how easy it is to change the battery yourself. I hope this helps. I was wondering how easy this would be to use, e.g. is it difficult to press the small buttons under water? The features do look pretty amazing. Thanks for the great review! Hi George, Have a look at the photo near the top of the article of the diver with the zoop on his wrist. This photo really gives you a sense of its size. On the Zoop page at Amazon, there are reviews of the Zoop and many state that it’s easy to press the buttons even with gloves on. I hope this helps answer your question. I know this is an entry level dive computer, but somehow I just don’t like the look of it. I feel it’s probably worth spending more to get one you’re happy with. Some of the reviews of other wrist DC’s here on this site are really good, and worth a read!